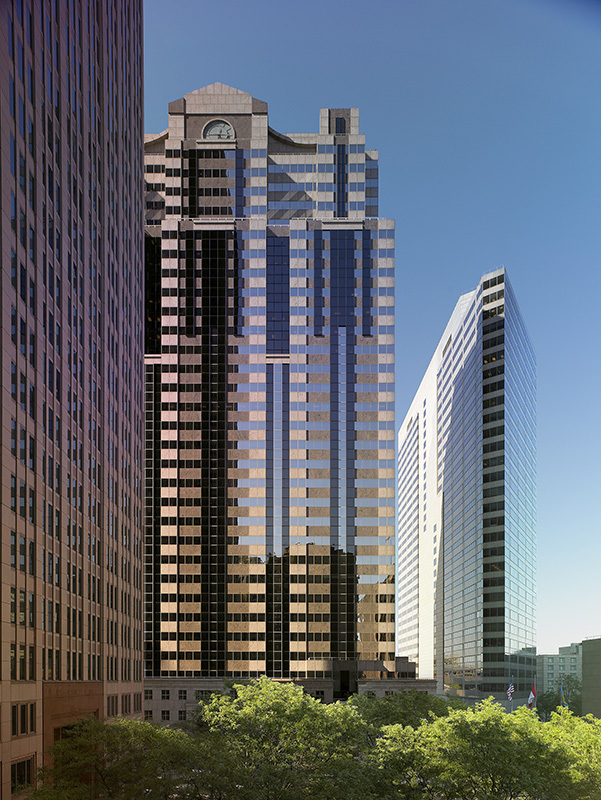 Two Logan Square, a classically sophisticated Trophy-office tower, is a 35-story skyscraper that overlooks the Benjamin Franklin Parkway at Brandywine Realty Trust’s Logan Square office triumvirate at 18th & Arch Streets. Located centrally in Philadelphia’s Business District downtown, the ENERGY STAR-certified Two Logan Square is a well-placed asset that affords quick connections to multimodal public transportation options, like SEPTA’s Suburban Station underground concourse and nearby Indego (Philly Bike Share) stations; additionally, Two Logan Square is connected to a 650-space covered car park. 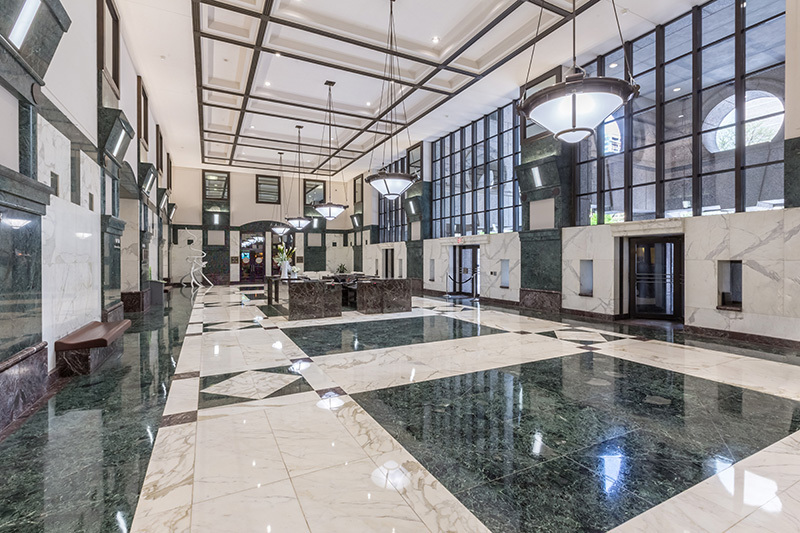 Designed by Kohn Pederson Fox, the celebrated 708,844 square foot building boasts a world-class, award-winning vaulted lobby bedecked with Italian marble. Two Logan Square offers its tenants the fastest fiber optic connectivity and complimentary Wifi to encourage a high-performance business environment. Such esteemed firms as Pepper Hamilton, LLP, EisnerAmper, and Comcast Corporation, are tenants of Two Logan Square; and, street-level retail features a renowned gastropub and a popular café – both unique to Philadelphia. The cultural charms of “America’s Most Artistic Mile” are within blocks of Two Logan Square: Sister Cities Park, the Cathedral Basilica of Saints Peter & Paul, Swann Memorial Fountain, the Free Library of Philadelphia, the Barnes Foundation, the Rodin Museum, the Philadelphia Museum of Art, the Franklin Institute, and more. Coffee shop & bakery located at Two Logan Square. Snacks, beverages, newspapers, magazine and other sundries are available in the lobby. Specialty sandwiches prepared to order along with other breakfast and lunch items. Our state-of-the-art training facility on the 26th floor of One Logan Square is available for tenants at One, Two and Three Logan Square. Designed for complete flexibility, users have access to multiple arrangements ideal for presentations and entertaining. The views are beautiful overlooking Philadelphia's famed Cultural District along the Benjamin Franklin Parkway. The facility is designed to accommodate up to 60 people and includes three hi-def projectors and roll down screens, WiFi internet access, mecho shades, built in speaker system, audio conferencing capabilities and more. To see the facility or reserve please contact the management office 215-656-4070. A sculpture piece from the "Steel Roots" series by Steve Tobin, a Philadelphia-born artist is installed at the Two Logan Square lobby. Steve is well renowned throughout the world for his sculptures and art work in various mediums. The Steel Roots series are inspired by nature and represent life and man's relationship with the earth. He believes that tree roots are inspiring as they strive, evoke life, new growth, the power of the unseen, connection to our environment and a symbol of our unity with our surroundings. For more information about the artist www.stevetobin.com. Located on the 49th floor of Three Logan Square, this state of the art fitness center is for the exclusive use of tenants at One, Two and Three Logan Square. There is premium quality exercise equipment, classes and amenities as well as incredible views. The facility is staffed with qualified health and fitness professionals ready to assist you with your wellness needs. 215-644-8678 or email 3logan@logansquarefit.com. Parking lot available on Cherry Street between 18th and 19th Streets.